You will find below the horoscope of Yvonne Murray with her interactive chart, an excerpt of her astrological portrait and her planetary dominants. Horoscopes having the same aspect Sun sextile Mars (orb 0°34'): Nicolas Sarkozy, Julia Roberts, Monica Bellucci, Emma Watson, Victoria Beckham, Nicole Scherzinger, Colin Farrell, Nolwenn Leroy, Coco Chanel, Charlie Sheen, Gordon Ramsay, Jane Fonda... Find all the celebrities having this aspect. Horoscopes having the same aspect Venus opposite Saturn (orb 1°00'): Heath Ledger, Jimi Hendrix, Gerard Butler, Matt Damon, Lionel Messi, Brigitte Macron, Victor Hugo, Michael Phelps, Howard Hughes, Lisa Bonet, Florence Foresti, John Forbes Nash... Find all the celebrities having this aspect. Celebrities clicked on in real-time: 576,789,475 times. Yvonne Murray MBE (born 4 October 1964 in Musselburgh), married name Yvonne Murray-Mooney, is a Scottish former middle distance track and road running athlete. She was inducted into the Scottish Sports Hall of Fame in 2007. Yvonne was 5 x Scottish outdoor champion. U.K. Champion at 3000 metres 1985, and 87. And also at 5000 metres in 1983. She was 5x AAAs champion outdoors, and AAAs Indoor champion in 84. She won the bronze medal at the 1986 Commonwealth Games for the 3,000m that were held in Edinburgh. She then went on to win the bronze medal at the European Championships for the same event in the same year. Here are some character traits from Yvonne Murray's birth chart. This description is far from being comprehensive but it can shed light on his/her personality, which is still interesting for professional astrologers or astrology lovers. 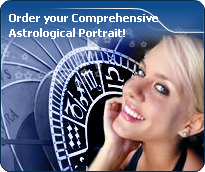 In a matter of minutes, you can get at your email address your astrological portrait (approximately 32 pages), a much more comprehensive report than this portrait of Yvonne Murray. Yvonne Murray, the nocturnal North-eastern quadrant, consisting of the 1st, 2nd and 3rd houses, prevails in your chart: this sector favours self-assertion and material security to the detriment of your perception of others. You consider self-transformation to be a hazardous adventure. You are inclined to seek stability and you tend to protect yourself with your actions. Possession, acquisition but also communication, without opening up too much, are part of your deep motivations. You are rather autonomous and constant, however it is important that you pay more attention to others, so that you can improve your outcomes. Yvonne Murray, Fire is dominant in your natal chart and endows you with intuition, energy, courage, self-confidence, and enthusiasm! You are inclined to be passionate, you assert your willpower, you move forward, and come hell or high water, you achieve your dreams and your goals. The relative weakness of this element is the difficulty to step back or a kind of boldness that may prompt you to do foolish things. Cheers for communication and mobility, Yvonne Murray! The predominance of Air signs in your chart favours and amplifies your taste for relations and for all kinds of short trips, whether real (travels) or symbolic (new ideas, mind speculations). You gain in flexibility and adaptability what you lose in self-assertion or in pragmatism. Your natal chart shows a lack of the Water element, with only 5.00% instead of the average 25%. Whether you are aware of it or not, affective values bring about problems, for you or your close friends. In general, a lack of Water does not necessarily mean that you are unable to love as much as others do. However, you may find it difficult to express the deepness of your heart and of your feelings. In the best cases, you come to terms with it, you adjust, you manage to show more affection or, why not, you pretend to be really affected! In the worst cases, you get into the terrible habit of repressing these essential values and you tend to forget that they are the basis of the richest and strongest bonds between human beings. Cadent houses, namely the 3rd, 6th, 9th and 12th houses, are very emphasized in your chart, Yvonne Murray. They indicate important potential for communication, adaptability and flexibility. These houses are symbolically linked to the mind and intellect. The relative weakness implied by these characteristics indicates your tendency to hesitate or to be indecisive, but also your remarkable ability to start off again, which is a nice quality, finally: you can easily get yourself out of a tight spot thanks to your mobility and casualness, in the best sense of the term. This group of houses corresponds to evolutionary characteristics of your personality. However, they are only indications and you must include them in the rest of your chart in order to see whether they are validated or not! The 3rd, 1st and 2nd houses are the most prominent ones in your birth chart. From the analysis of the most tenanted houses, the astrologer identifies your most significant fields or spheres of activity. They deal with what you are experiencing - or what you will be brought to experience one day - or they deal with your inner motivations. After this paragraph about dominant planets, of Yvonne Murray, here are the character traits that you must read more carefully than the previous texts since they are very specific: the texts about dominant planets only give background information about the personality and remain quite general: they emphasize or, on the contrary, mitigate different particularities or facets of a personality. A human being is a complex whole and only bodies of texts can attempt to successfully figure out all the finer points. You are so proud and generous, Yvonne Murray, that the power of your love contains in itself your vulnerability. However, this is precisely what makes you charming and original. You are loyal and straightforward and you need to love as much as you need to be loved. Both feelings are tightly linked and there is a real danger that love is broken up by trivial misunderstandings, just because your touchiness is affected. You are demonstrative, brilliant, and even dramatic, with a legendary generosity. For you, everything is, or must be, excessive: gestures of love towards your partner, your presents, your comfort and the luxury, which marks your outings and your travels. You are physically a lion, at least, you have its sexual appetite; you are voluptuous and passionate. Flexibility is the only thing that is out of your reach, in the ways you show your love, as well as in your responses to annoying events. What an energy, Yvonne Murray! You take so many initiatives, you have so much strength for action, construction and struggle! You are part of the conquerors, loyal and concerned about panache. Your vitality is such that you can achieve your objectives and release all your creativity. However, you are so proud and so unyielding that you cannot tolerate the faintest annoyance on your way: if you are vexed, you may turn into the opposite direction as a matter of reaction. Sexually, your magnetism and your energy work wonders. You are not complicated and, as long as your slightly domineering nature is respected and you are granted due admiration, all goes perfectly well. You usually have a lot of self-confidence and you believe in you. This characteristic feature may turn you into a hero with Hercules's strength and solar charisma. This text is only an excerpt from of Yvonne Murray's portrait. We hope that it will arouse your curiosity, and that it will prompt you to deepen your knowledge of astrology, as well as to visit and use the wide range of free applications at www.astrotheme.com.